Transferring to a new phone system can often be a cause for caution for businesses, especially if you rely on daily communication. But with 4Com, you can rest assured you won’t suffer from outages, thanks to our comprehensive installation process. Find out more about how it works below. What is the 4Com installation process? With us, there are a few separate steps involved in the installation process, throughout the lifetime of which you’ll have a dedicated Customer Project Partner who’ll support you by answering any queries you may have, and making sure you’re informed about the progress of the installation at all times. The first step involves the initial installation of your new phone system alongside your existing one. This should happen within 2-3 weeks and is the perfect opportunity for you to receive training from our engineers using test phones. You’ll be able to make sure you completely understand how both the phones and software work, as well as make sure your questions are fully answered. Next, we’ll be working behind the scenes, making sure everything is properly transferred over to your new system. Once this has been tested and is complete, we’ll carry out either a final phone call or site visit to make sure everything’s working as it should. At this point, we can also provide further training if you need it. What credentials does 4Com have in this area? At 4Com, all of our engineers have completed the CompTIA+ course and our support team are among the highest trained in the telecoms industry. These factors make us both experienced and knowledgeable when it comes to business phone system installations. Our engineers also have an average length of service of 7 years, making our team well placed to handle all manner of questions. How can I get in touch with the 4Com team? At 4Com, our UK-based support team are on hand to help should you need to speak to us. You can contact us through our website or on Twitter, but we also have a dedicated site, 4Care, specifically designed to help our customers. 4Care is available for all our customers. Here you’ll find lots of helpful guides and videos, as well as instructions and FAQs. Your phone system installation will start just a few days after confirmation of your order. We’ll deliver your new phones to you and provide training, allowing you to get used to them alongside your existing system. We’ll then be transferring all of your lines over to us, while installing any new services you have asked for. When all of this is done, we’ll either come back and see you, or simply call you to confirm that your installation has been completed. As installations vary in complexity and size, it is difficult to give an exact timescale; we have been able to complete them within a month, but others can take up to 3 months to be completed. How long does 4Com offer support for? At 4Com, we offer support to our customers throughout their time with us. 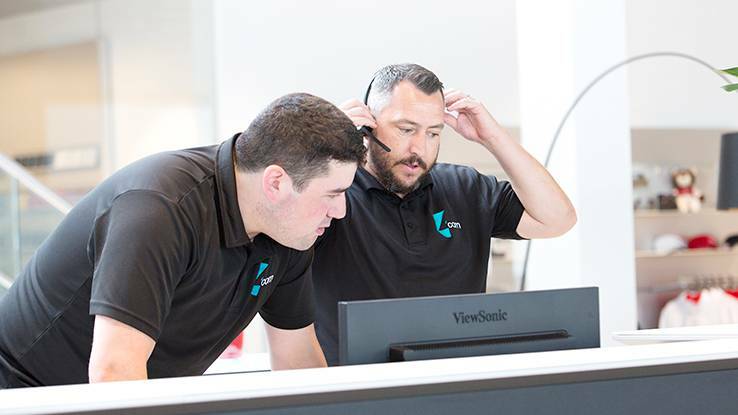 As well as providing a dedicated customer support team, our highly trained engineers are also available to be called to your location should you need them. While our head office is in Bournemouth, our engineers are road-based up and down the country, meaning it’s often quick and easy for them to visit your site. What is the process for resolving issues? If you have a problem with your phone system, our 4Com customer services are on hand to get it resolved. Firstly, you can use our dedicated site – 4Care – to find FAQs, videos and guides on a wide range of aspects of the systems we offer. If this doesn’t provide you with an answer, our customer support team are some of the highest trained in the telecoms industry and based in the UK. They’ll be at the end of the phone to help you in a fast and professional manner. If neither of these options help, our engineers can come to you to get the issue sorted. They’re based throughout the UK, meaning they can easily travel to you to help get your new system up and running as it should be.